Welcome to Top Word Games! We've searched the Internet to find the most fun and addicting word games. Words - aren't they wonderful? Words are the means of communication. Through words we can express our emotions - happiness, anger, sadness, and everything else in between. And here's the best part: with words, you can keep the fun going for hours and hours to come! Especially if you are at TopWordGames.com and you are playing one of the top word games we have on offer! TopWordGames.com is your one-stop spot for playing the best, most engaging, and fun-filled word games that the internet has to offer. Whether you want to keep your vocabulary wide as ever, if you are new to word games, or just want to kill some time while it's raining outside and things are getting boring, TopWordGames.com has the word game perfect for you! If you think you are REALLY good with words and your vocabulary is really wide, then TopWordGames.com is an excellent place to show off your skills! Thanks to our global scoreboards, you can easily post your score from our most popular word games for everyone to see and compare. All you have to do is register for free and...voila! Playtime is on! Stick figure games are fun...period! And if you are looking for top word games that combine the challenge and fun of stick figure games, then you are at the right place! For one thing, The Wizard's Notebook, one of the MOST popular stick figure and word game combinations, have made it to the top spot! The story? Save the princess! BUT what's a stick man to do? Well, A LOT especially when you have words to materialize and help you in your quest. 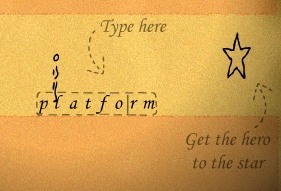 We all want our games to be visually pleasing - even word games. And Clockwords: Act I is just that...AND MORE! Aside from the smooth graphics, the premise of this word game is action packed and simple to pick up: type out words and allow your robot cannon to shoot down those robotic spider bugs that get in the way. And to make it even sweeter, you get new power ups, mini game mode, and new high score system...making your gaming experience even better! Want to play classics like Hangman? What about Hang-a-Roo? I fell in love with those games too and one of the top word games we have is just like that...BUT a non stop version: Meaning Fall. It's a little generous since you have three lives. BUT when you fail to guess the word, it's all the same: hang him! And we are NOT even getting started! Want to check out and play the top word games of the internet? Then register now and start playing at TopWordGames.com!